Join us Saturday August 26 at Fork’s Farm Market in Orangeville for their Brew Fest. We will have Six-Packs, Crowlers, T-Shirts and Stickers available for purchase. We are now bottling. 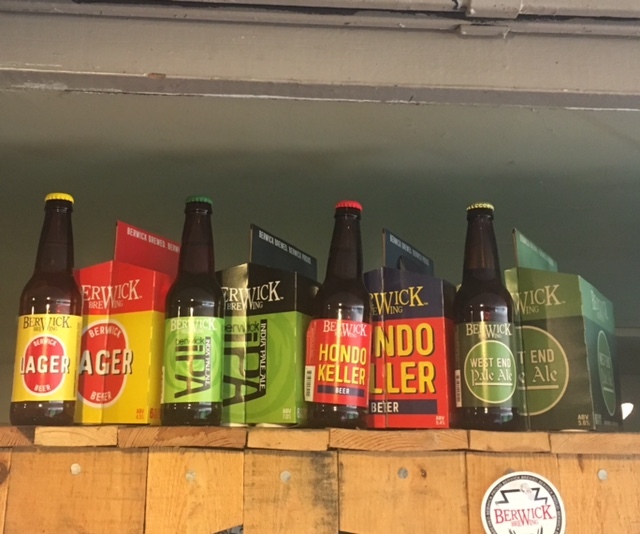 Currently we are carrying 12oz bottles of Berwick Lager, Hondo Keller (German Style Lager), and West End Pale Ale in Six-Packs and Cases. You can buy them in the Pub. Berwick IPA will be back soon and Oktoberfest Season is almost here. Farmer’s Market Season has arrived and the LCB has changed a few things. Breweries are now able to sell beer at local Farmer’s Markets and we acted upon that. This market season you will be able find us at BEYOND THE BLEND MARKET on West Front Street in Downtown Berwick and FORK’S MARKET in Orangeville, PA. We hope you are as excited as we are. Friday is Cinco De Mayo. A great reason to serve TACOS in the Pub. Join us for Beef Tacos with Guacamole in addition to our usual Friday and Saturday menu. That menu includes Fried Wisconsin Cheese Curds (we buy them by the pallet directly from Wisconsin), Poutine and Fries. We always have our famous Thin-Crust, Hand-Tossed Pizzas and Soft Pretzels and 25 beers on tap.